iRocker is one of the top-rated ISUP brands in the industry. They offer some top-notch inflatable paddle boards. 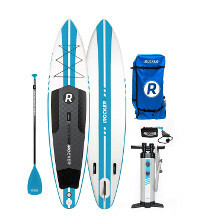 iRocker enabled its customers to climb mountains and fly through states with their gigantic paddle board in a backpack. In fact, the brand even challenged the negative reputation on inflatable objects with its top of the line inflatable paddle boards. The brand is undeniably successful and that boils down to the core belief that a quality product will drive along a culture of loyal fan base who appreciate a quality iSUP. 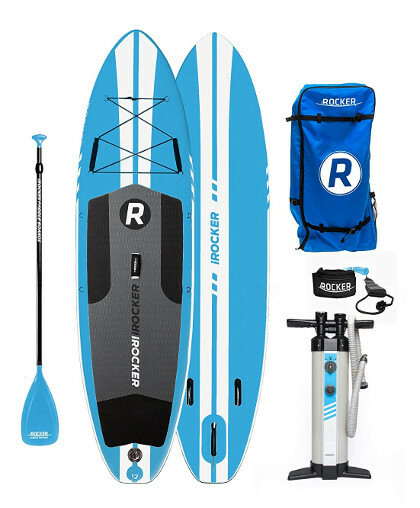 iRocker has dedicated its focus to create a myriad of diverse inflatable paddle boards that are designed to appeal and cater for the needs of every paddler out there. Indeed, the brand has launched gigantic, medium and small stand up paddle boards, it has produced fishing, yoga and touring iSUPs and earned a gold throne in the industry. So, let’s take a glimpse at the brand’s legacy through the eyes of some of their best-selling inflatable paddle boards. Starting with one of the company’s highest accomplishments, the Cruiser has actually accumulated quite the reputation in the iSUP universe as one of the most holistic iSUPs. Hence, at 10 feet 6 inches in length, the iRocker Cruiser is specifically designed to best fit young adult and adult paddlers, eliminating teenagers by a large margin. Further, the board measures exactly 33 inches in width, which makes it one of the most stable iSUPs out there. Eventually, to wrap things up, the board goes for a satisfying 6 inches in thickness, which will prevent the board from going below under a maximum weight capacity of 400 pounds. Knowing that it comes in 5 different colours, the next thing to learn about this board is its ability to perform. Like any other paddle board, the Cruiser is capable of floating but that isn’t all there is to this iSUP. In fact, the Cruiser is one of the most dynamic boards on the market. Its smooth edges, pointy nose, wide hull and narrow tail make of it a highly competitive board. Moreover, the Cruiser is even more impressive when it comes to tracking in a straight line thanks to its triple fin navigation system. 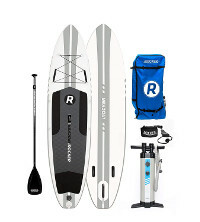 Overall, the Cruiser might not be a racing board but it can be a fishing, a yoga, a touring and a white water stand up paddle board all in one. 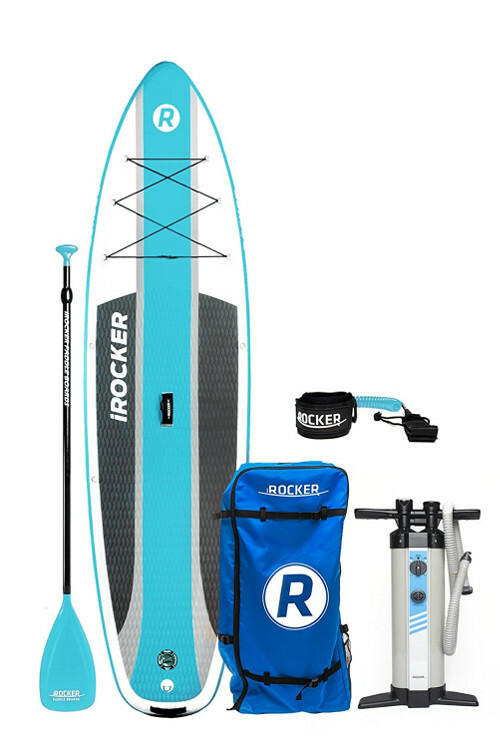 To wrap it up, the iRocker Cruiser is a solid iSUP and that is confirmed via the wholesome package with which it is shipped in and that includes pretty much everything you’ll need to pilot and maintain the board for as long as you own it. The legacy of the iRocker carries on with the SPORT model, which is one of the company’s most hyped boards. Indeed, the SPORT is showcased as one of the leading boards for iRocker and rightfully so. The SPORT could be an entry-level board but it is notable to mention that it is designed with an enthusiast in mind. Indeed, the board is magnificent as it measures a jaw dropping 11 feet in length, which limits accessibility to the board for adult and adult sized paddlers. For a board this long, the brand decided to go with a rather slim 30 inches in width to highlight that sport title while still granting you an ample space to adjust yourself comfortably on board. Lastly, the SPORT stands at a universally approved 6 inches in thickness, giving this iSUP the buoyancy and rigidity it requires to cater for a maximum weight capacity of 350 pounds. As far as performance goes, you can tell just by looking at this board that it has been developed to perform like a beast. Indeed, the SPORT is enhanced in many ways in order to take on any environment, ranging from peaceful lake touring to avalanche white water rush. Accordingly, the board at hand exhibits smooth yet defined edges, sharp lifting nose, a slim hull and a nice compact tail for enhanced responsiveness. 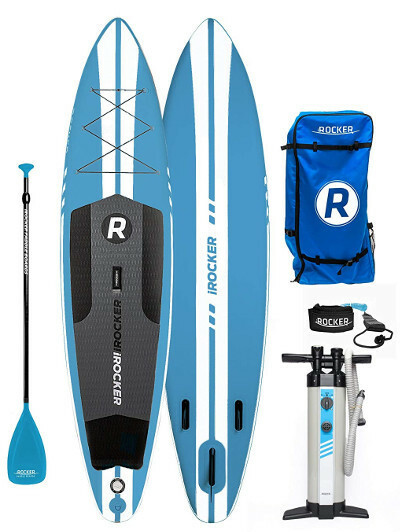 To seal the deal on the iRocker SPORT, the company decided to play it safe and hook this board up with a complete package that comes with all the necessities and tools you’ll need to keep your board in check and ready to go at all times. 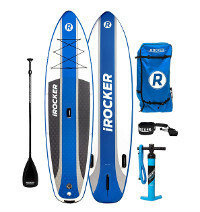 The All-Around iRocker is just as the title indicates, a board that is designed to be versatile and compatible with most paddlers out there. Indeed, this board is capable of catering for the needs of most paddlers out there and especially those who are looking to land a proper first step in the game. The All-Around is special due to its versatility but that can only be seen once you realize that it offers the exact same features and perks in two different sizes. Indeed, the board at hand comes in 10 and 11 feet in length, which makes it great for teenager, young adult and adult paddlers all at once. Also, the board exhibits impressive width and at 32 inches, there is so much you can do on this board with the constant concern of falling off or waggling violently out of balance. Lastly, the All-Around makes a whole circle with its absolute mercy of a 6 inches thick hull. The hull is thus fortified to the maximum and capable of catering for a maximum weight capacity of 370 to 435 respectively. As far as performance goes, you need to understand that the All-Around is not exactly a perfect board for everything but actually one that is capable of performing every task impressively well. Indeed, this board is developed to endure and adjust with almost every circumstance and environment it is put through. The All-Around is an entry level board designed for people who would like to have a holistic experience of paddle boarding and that includes touring, racing, relaxing, sunbathing, yoga and pretty much everything else that can be done on a board. Fortunately, the board at hand is supported via its rounded design, smooth edges, sharp nose and fairly slim tail to perform respectfully in most circumstances. Thanks to the triple fin system, the All-Around is also capable of tracking nicely but all that would be so hard to appreciate if not for the wholesome package the board comes with. Indeed, the All-Around stays true to its title by coming in a set of tools and accessories that will make your journey memorable.